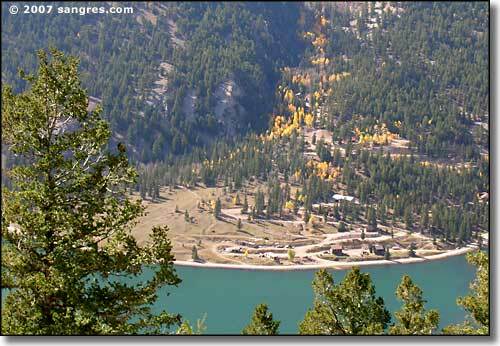 Lake San Cristobal was formed some 700+ years ago when the first Slumgullion Earthflow came crashing down from above and blocked the Lake Fork of the Gunnison River. The Earthflow is still moving but it isn't affecting the lake any more. 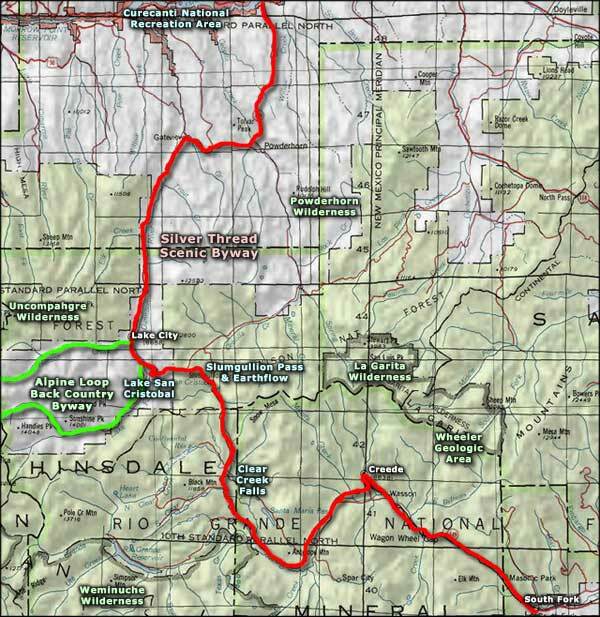 The road that accesses the lake from the Silver Thread Scenic Byway is also the beginning of the Alpine Loop Back Country Byway. 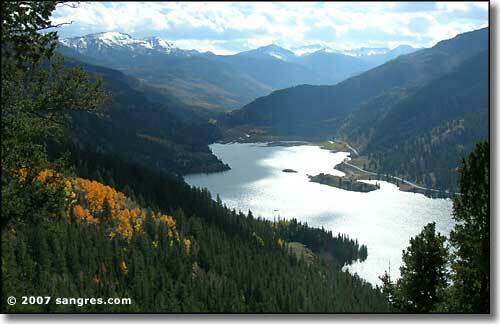 This road heads west into the San Juans and crosses Cinnamon Pass to Silverton. Today there are a number of developed campsites around the lake and it looks like an excellent fishing spot for coldwater fishing. 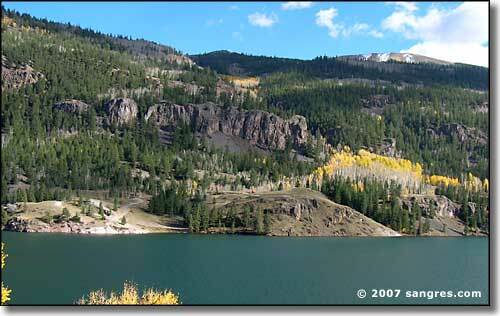 The lakeshore is private property surrounded by the Gunnison National Forest. The road leading west up the canyon goes to the trailheads leading to Redcloud, Sunshine and Handies Peaks, all 14ers. Near the turn-off to the lake on Highway 149 is the Alferd Packer Memorial, marking the place where Alferd Packer supposedly cannibalized his companions on a fateful winter journey into the San Juan Mountains. Packer was guiding five men through the mountains of central Colorado in 1874 when they ran out of food and energy in shoulder-deep snows. At his trial in 1883, the court held that Packer killed four of the men in their sleep and killed the fifth after a struggle. He then ate parts of the remains until he was able to walk 50 miles to an Indian agency in the Cochetopa Hills and then walk another 50 miles over the Continental Divide to Saguache. He was arrested in 1883 in Wyoming and brought back for trial. Sentenced to 40 years, he was released from prison in 1901 and died in 1907. Photos courtesy of Sangres.com, CCA ShareAlike 3.0 License. Text Copyright © by Sangres.com. All rights reserved.